Ladies and gentlemen, today has been a terrible day. Terrible. Today, before my very eyes, my childhood hero (and the childhood hero of my father and my father’s father before him) withered away and became just another implement of all the evil that exists in this world (and beyond). Since the 1930s, Superman has been a cultural icon for Americans. He is a part of our folklore and has become one of the ways by which we indoctrinate children into the “American way” of life. It is the unwritten rule of the comic book world that the superheroes never lose faith in the justice system we have established for ourselves. Perhaps it is flawed, and from time-to-time corrupt villains arise who use that system for their own gain and not for the good of all. But our heroes don’t lose hope. Ever. They keep pursuing justice because they know that flawed as humanity might be, our sense of justice is rooted in something far bigger and far more powerful than anything here on earth. When General Zod actually made that reference in the movie, I chuckled. But how wrong I was. General Zod is a force of evil. He has been bred and genetically engineered for one purpose alone: warfare. He will protect his people with deadly force, destroying all other life that gets int he way. Of course, he doesn’t see himself as a destroyer. He sees himself as a savior. And he really believes that what he is doing is for the salvation of his people. But the fruits he bears is the evidence we need to decipher his false teachings from the Messiah’s true teachings. Wherever Zod goes, death and destruction follows. Not life. It turns out that General Zod is a thief who has somehow caught the universe unawares. Now, this is where Superman usually enters the picture and becomes our messianic man in a cape. The fruits that Superman has always produced have been full of life and goodness. He saves life. He risks his own life to preserve the lives of others. He is willing to die to ensure that all of us, imperfect as we are, have a chance at redemption. It is for this reason that every student who has ever entered into the hallowed halls of schools of theologies across our nation have at some point engaged in the Superman-as-Messiah-figure conversation. And although I have had people try to convince me that Jesus is no messiah-figure, but an implement of global militarization, or the result of America’s sense of superiority and distinction from the rest of the world, or even a half-cocked vigilante, I never let go of my childhood idea of Superman as a superhero manifestation of The Christ. I have even lead Bible studies in which I drew the parallels between Superman and Jesus, laid out the talking points that believers could take from Superman movies to discuss faith with non-believers, and used Superman as an illustration in children’s sermons. It turns out, General Zod was right all along. There was only one way, and he had chosen it. The force of evil had entered the world and wrote the rules by which he was going to fight our sense of good and righteousness… and our hero obeyed. The only way Zod could see was death. 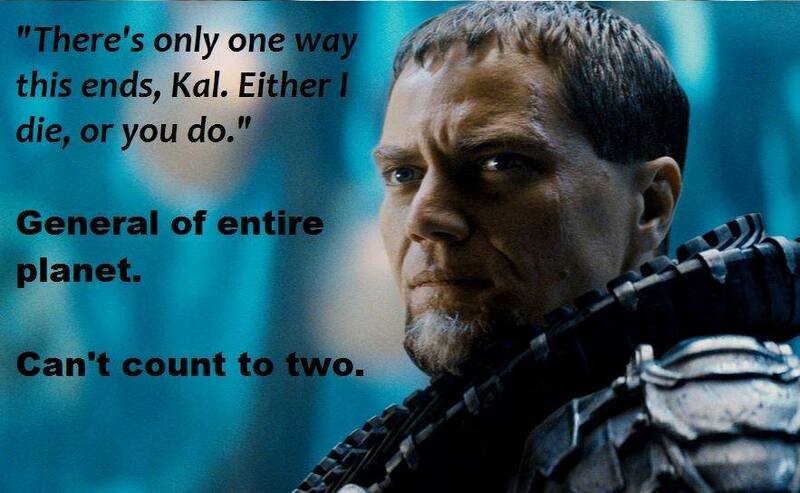 Because Zod is evil. And evil only sees death and destruction. But Superman was supposed to be better than that. Superman never loses his hope and faith in justice. He always gives everyone, everyone, a chance at redemption… even those who we deem most irredeemable. Superman was not supposed to give in to Zod’s rules, but write his own. His rules were supposed to encompass a respect for life, a trust in the pursuit of justice, and the hope of the redemption of even the worst offenders. But rather than uphold his messianic character, Superman gave in to satanic influence. He played by evil’s rules. And death won. Yes, folks, today is a sad day for me. A childhood hero shattered under my scrutinizing eye and revealed himself to be no better or no worse than the rest of us… just another person, albeit a spectacular one, who fell under the weight of evil and sin. Just another man, despite his amazing feats, who is in the same dire need of salvation that we are all in. I won’t be watching the sky tonight, wondering if that thing I see is a bird, a plane… or perchance Superman… because Superman, it turns out, needs saving, too. So I guess my eyes will shift back to the image of the empty cross and to the empty grave. My attention will refocus on the one who saw the destructive forces of evil in the world and didn’t play by their rules, but put himself between evil’s destructive power and us. My heart will dwell on the one who died to save me from perishing… and tonight I will remember that there is only one Christ, and no man in tight suit and cape will ever change that. I want to share this piece of another blog with you because I read both your post and his and I feel compelled to offer you a different perspective on Superman’s choice to kill Zod. Both my husband and I felt moved and inspired by the “new” Superman. His choice at the end felt right to me, because Zod was so determined to save “his” people at all costs…even the cost of the entire population of Earth that death was the only thing that could stop him. As a preacher, what can you tell me about the division of humanity into clean and unclean?